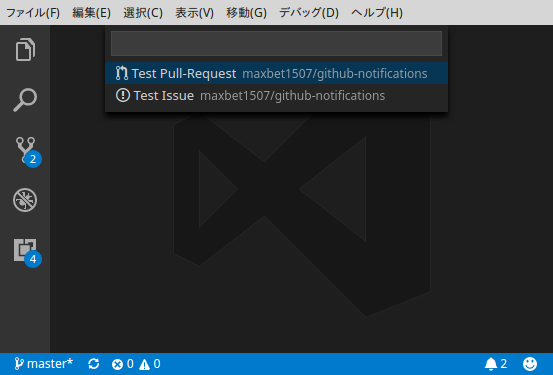 Visual Studio Code>Other>GitHub NotificationsNew to Visual Studio Code? Get it now. Check your GitHub Notifications periodically (60s). Unreaded pull-requests and issues for you will be notified by the status bar icon. You can open unreaded pull-requests and issues web page directly in the default web browser. When you have unreaded GitHub Notifications, status bar "Bell" icon have unreaded threads qty. click status bar "Bell" icon. press F1 key and select/type "List GitHub Notifications". Required your GitHub username and password settings. Select the menu command File > Preferences > Settings (Code > Preferences > Settings on Mac). Fixed subject.latest_comment_url is null. open subject.url insteadof subject.latest_comment_url.